As someone who grew up in the heart of Chicago but who has also unabashedly fallen in love with New York, I take issue with how often people seem to like to pit these two cities against each other. Some of my dear Chicagoan friends tell me that New York is too crowded, too dirty, too expensive, too pretentious, not nearly as incredible as it claims to be. Meanwhile, native New Yorkers have informed me that Chicago is nothing but a ‘second city,’ too Midwestern, too gang-ridden, insufficiently cosmopolitan, always trying yet inevitably failing to live up to the greatness that is New York. What is this ridiculousness? Why can’t each city be appreciated in its own right instead of being regarded as an inferior version of the other? Why can’t we all just get along? Spoiler alert: This will not be a Chicago vs. New York blog post. I’m not in the business of polarizing my audience. Plus I’ve never been a huge fan of taking sides in such debates. Call it indecisiveness, but I don’t see things in black and white—I’m more of a gray area kind of gal. So these past few weeks of winter, as Simon and I split our time between Chicago and New York for the holidays, I was interested not so much in comparing these two cities but rather in having new and inspiring experiences in both. 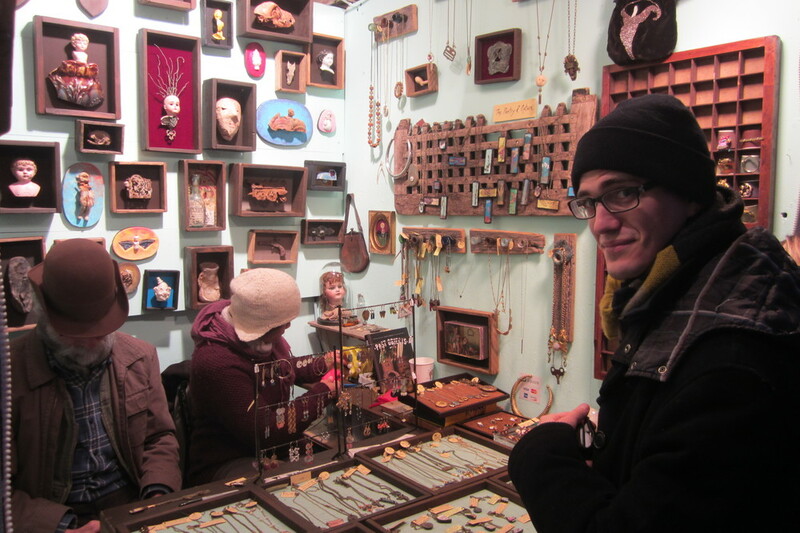 In mid-December, as part of our last-minute scramble to find the perfect Christmas gifts for our families, we visited the Union Square Holiday Market. It turned out that the rest of New York was in an eleventh-hour Christmas shopping frenzy too—the market was so packed that the only way to explore each vendor’s offerings was to join the long, snail-paced line weaving through the square and wait a minute or two at each stall to get a front-row vantage point. But everyone was in good spirits, and the body heat the crowd collectively generated on that 30-something degree day made for a surprisingly cozy outdoor shopping experience. We had many excellent finds (a lovely red infinity scarf for my mom, a Toulouse Lautrec-inspired set of coasters for Simon’s mom, etc., etc.) but by far the most interesting stall we came across sold handcrafted jewelry and wall décor made of antique ceramic plates, vintage coins, animal skulls, and other ancient curiosities. The vendor, Scott Jordan, told us that he had personally collected the artifacts for the jewelry and wall art by conducting urban archaeological digs at various sites across the city. We found this absolutely fascinating, and we’ll certainly be returning to the holiday market next year. Shopping on Amazon may be convenient, but the holiday market is a much more intimate, creative, and fun setting for finding that perfect gift. Our second New York adventure of the winter was a trip to City Bakery. I had discovered City Bakery on a scrumptious list of 27 places in the world to get incredible hot chocolate. So when we walked through its doors I was thoroughly expecting to be wowed, and City Bakery delivered!! Our hot chocolate was so decadent that it was served not in a mug, but in a bowl, with a spoon. It was a thick, creamy, and rich milk and dark chocolate concoction that came with an enormous, fluffy, made-in-house marshmallow on top. And it was heavenly. To top it off, the buttery and flaky pretzel croissant we ordered with it was the perfect complement—the saltiness of the croissant offset the sweetness of the hot chocolate just enough to leave me wanting more of both. I’m getting excited all over again just thinking about it! The only other time I can remember having such an amazing winter treat was during our visit to Angelina three years ago, a café across the street from the Louvre in Paris. So I feel so very lucky that the gem that is City Bakery is in lower Manhattan, just a few subway stops away from home. You might just find us there the next day that it drops below 30 in the city. Oops, I think that’s tomorrow! Two days before leaving town for Chicago, we celebrated my birthday on Broadway and attended a performance of If/Then at the Richard Rodgers Theatre. I think most Broadway shows could be appreciated from just about any theater in the world, but I was really happy we got to see this particular one in New York itself. In case you’re unfamiliar with the show’s premise, it’s a very contemporary sort of musical that traces the alternative paths that a woman’s life can take based on one small and seemingly trivial choice that she makes after moving to New York City. Having spent the past year and a half making big decisions, wondering about their ramifications, and trying to make it in New York myself, I really connected with the story on a personal level. 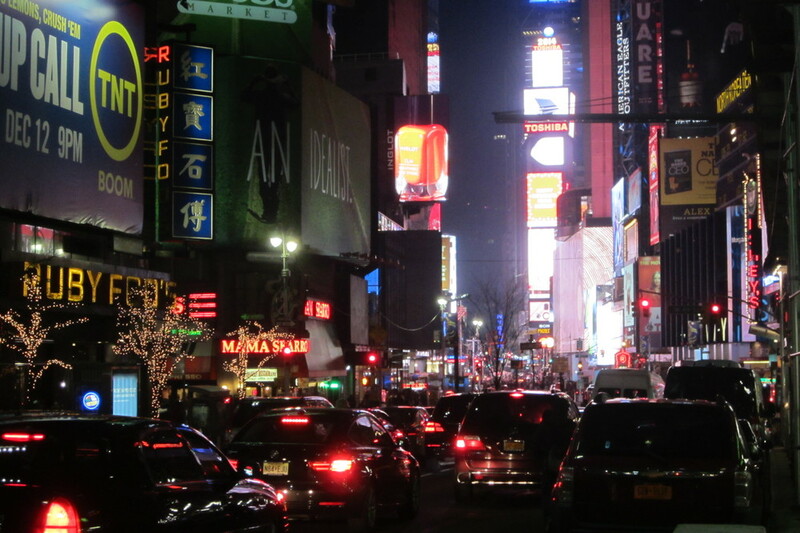 I won’t spoil the ending for anyone, but let me just say that Idina Menzel was fabulous, and that as we left the theater and walked toward the lights of Times Square, I was filled with a sense of endless possibility. New York as of late often makes me feel this way. We made it to Chicago just three days before Christmas, and on this particular visit we were determined to not only catch up with family, but also to experience the city from a fresh perspective. Growing up there it had been so easy to take our surroundings for granted. This time, though, we were ready to soak up the city, to rediscover it, to make new memories there. And so, after making a big batch of Swedish chocolate balls for Christmas day, I took my little brother to the annual Zoo Lights festival at Lincoln Park Zoo. The event was clearly geared towards children and families, but I found it pretty magical myself. It began at 5pm, after normal zoo hours had ended, and while the animals all appeared to be sleeping, every tree, patch of grass, and walking path in sight had been illuminated by a gorgeous holiday light display. The zoo had transformed into a winter wonderland of sorts. You could see the breathtaking Chicago skyline across the pond. And even the typically frigid weather was on its best behavior for us. We spent a good two hours wandering amidst the lights, taking in the festive atmosphere, and snapping enough photos to exhaust our camera batteries. We spent Christmas itself and the days directly after it with Simon’s lovely extended family, playing cards, watching movies, and giving and receiving a rather extraordinary amount of gifts. And once the celebrations slowed down a bit, we went on an adventure to find a favorite Chicago coffee shop. We already had a couple of favorites in New York (they’ll be featured on our coffee project page very soon, promise!) but none yet in our hometown (we were over-scheduled high schoolers the last time we’d lived there, after all—coffee shop hopping hadn’t been a priority at the time!). So we found this fabulous list of Chicago’s best coffee shops and decided to try two of them. First, we met up with a dear old friend at Gaslight Coffee Roasters in Logan Square. The latte there was hands-down incredible. Creamy and nutty with just the right touch of acidity, flavorful in a layered and complex way. And we loved the spacious, industrial, loft-like sort of vibe in the coffee shop too; it was exactly the sort of atmosphere we’d hoped to find in that corner of the city. Our next coffee shop stop was The Perfect Cup in Ravenswood—Simon’s parents took us there. At The Perfect Cup, interestingly enough, the latte was actually somewhat less amazing than the establishment’s name suggests. But we were okay with this because the café itself was so darn cute. It was sunny and bright, with large comfy couches and Ikea-like dining room furniture. Our table was large enough for a game of chess and a game of cards to be played side by side. Overall, The Perfect Cup felt like it could have been a close friend’s apartment; it was a homey, inviting, and comforting place to while away a cold winter afternoon. As I write this, it’s nearly one week later, and we’re back in our little Upper West Side abode. Winter is far from over, but we’ve loved wrapping up 2014 with these Chicago/New York adventures and we’re super excited for whatever the new year will bring. For now, given the pile of cookbooks that I got for Christmas currently sitting on the coffee table (and given the frighteningly cold forecast for the weekend! ), I’m thinking I’ll spend the next couple of days holed up in the kitchen, cooking up some mushroom bourguignon and malted chocolate pecan pie...Stay warm, everyone!